As part of its world tour, the one millionth 911 is stopping over in the USA. The iconic sports car will be on display in New York in a very special setting. Where else but New York? For Porsche, there is no better place in the USA in which to display the one millionth 911 than the Big Apple – after all, it was here that the Stuttgart-based sports car manufacturer’s American story began. It is a story that is closely intertwined with the name Max Hoffman. The New York car dealer’s enthusiasm for Porsche sports cars, along with his special aptitude for sales, formed the basis for brand’s rapid rise in popularity in the USA. Indeed, in a New York showroom in autumn 1950, Hoffman exhibited the first Porsche in the USA – a 356. The first test drives on American soil took place along Park Avenue. Now, nearly 70 years later, the anniversary model of the iconic 911 sports car will travel the very same streets. To celebrate the event, Porsche Cars North America invited guests to a Design Forum in honour of the 911. At an exquisite exhibition of rare 911 models that included the first 911 ever built – now owned by Jerry Seinfeld – host Jay Fielden, Editor-in-Chief of the American men’s magazine “Esquire”, spoke with Tony Hatter (Director of the Design Quality Style department at Porsche), Hurley Haywood (US racing legend and Porsche brand ambassador), Michael Prichinello (founder of the Manhattan Classic Car Club) and Rama Corpash (professor at the Parsons School of Design) about what it is that makes the 911 such an unmistakable design icon. Tony Hatter: “It was great fun. You can really feel the enthusiasm for the brand and the car”. 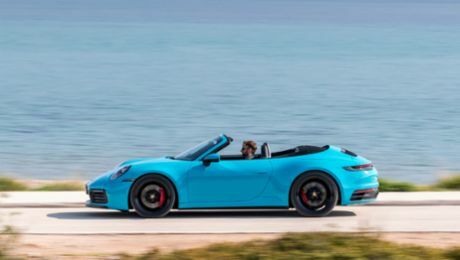 Porsche continues on its world tour with the anniversary 911 model: Its next stop will be the Pebble Beach Concours d'Elegance event in California. Afterwards, the special model will journey to Asia.